The FAQs are for merchants only. For more information or FAQs about being Mobile Money Users, please logon to http://www.mobile-money.com or check out the website by participating banks. 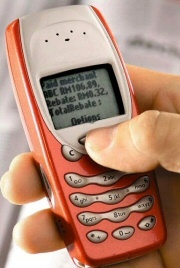 One of the question that might pop-up in your mind, why this Nokia 3315 that show up in the advertisement and marketing materials of Mobile Money instead of state-of-the-art PDA / 3G phone? Simple! The idea is to illustrate that Mobile Money will work even with your outdated model phone that can send and receive SMS. The fule of thumb is, as long as you are NOT using the very first generation of cellular phone, it should really work fine. You don't need the latest model phone to participate in the payment revolution. Motorola DynaTac 8000X, the first mobile phone ever invented by Dr Martin Cooper. This phone definitely cannot work with Mobile Money. Kindly donate it to the museum. You don't need this Smart Phone powered by Windows Mobile 5.0 to use Mobile Money as well. We actually have one of this. It's just OVERKILL.